Envira Gallery is a responsive image gallery plugin for WordPress that aims to distinguish itself from the competition by offering a simpler gallery creation process, while still allowing you to present your photos in style. NextGEN Gallery is the most popular image gallery plugin for WordPress, with the free version achieving over 11 million downloads to date. However, the huge feature list and selection of settings and options for creating galleries has drawn criticism from those looking for a stylish, but quick and easy way to get their photos online. Envira Gallery by Thomas Griffin, aims to strike a balance between simplicity and high quality design. Thomas has also created the Soliloquy slider plugin and the popular lead-generation OptinMonster plugin, which we looked at here. To find out whether the goal of delivering a user friendly image gallery plugin for WordPress has been achieved, this review will take a closer look at the features of Envira Gallery and see just how easy it is to use, as well as helping you to determine whether or not it represents good value for money. Envira Gallery is available on four licenses, plus a free lite version, which is available from the WordPress Plugin Repository. 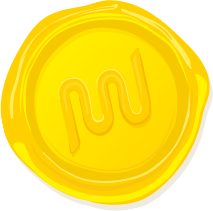 Other differences between the plans include the number of sites the plugin can be used on, and developer options for incorporating the gallery into a theme for re-sale. Apart from the Platinum license, which gives you lifetime access, the other licenses must be renewed annually (at a discounted rate) in order to retain access to support and updates. The plugin will continue to function without a renewal and work unsupported. Depending on the license you choose, you will get access to a selection of files to download from your Envira Gallery account area. With access to the Envira Gold license, there were 13 files to download, covering the core plugin and the complete library of optional add-ons. Thankfully, the add-ons that your license gives you access to can be installed with just a few clicks directly from the plugin dashboard. This is great as it saves you the time and effort of uploading them individually to your website. There is of course online documentation available, covering everything from getting started to more advanced topics such as pre-packaging Envira Gallery with a theme. Many of the online articles are accompanied by walkthrough videos or code snippets to help you get the most from the support materials. After uploading the core plugin and activating any of the add-ons you want to make use of (and that you have access to), you can start creating image galleries for use in your posts, pages, and elsewhere on your site. The plugin adds a new top level menu item to the sidebar of your WordPress site’s admin dashboard and it’s from there you can manage any existing galleries as well as create new ones. When it comes to creating your first gallery, the process is thankfully very straightforward. 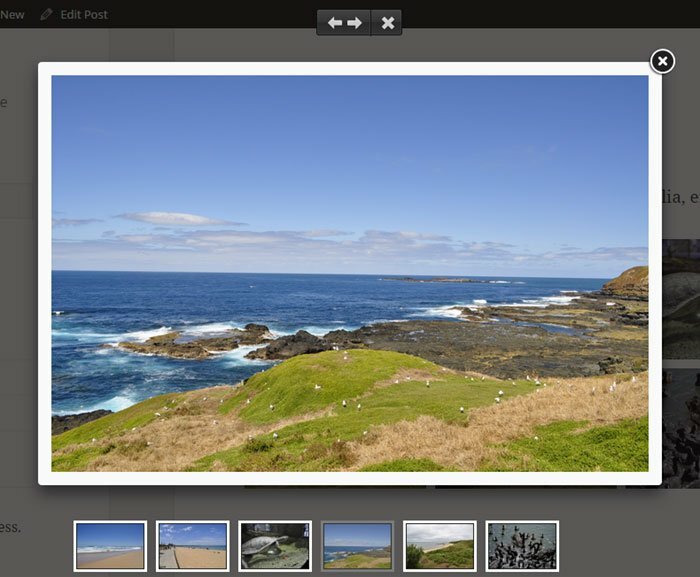 Simply click on the Add New button, give the gallery a name, and then drag and drop the photos into place. 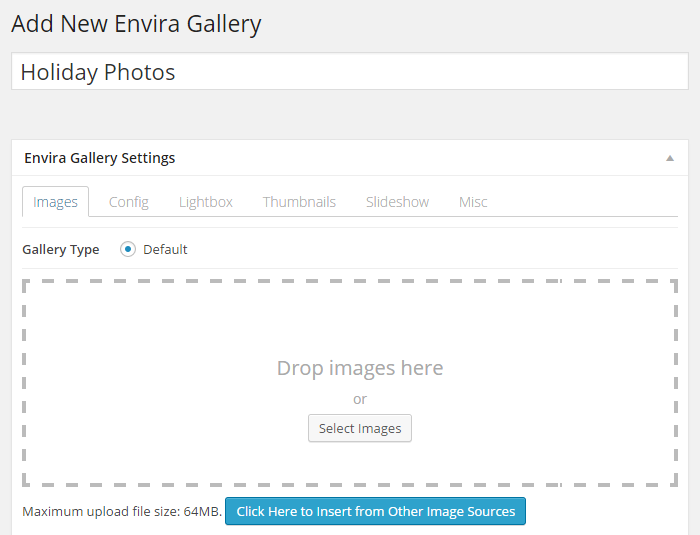 As the backend makes use of the native WordPress user interface, anyone who is familiar with adding images to posts in WordPress should have no problem creating their first gallery with Envira. You can also just as easily insert any images that have already been uploaded to your site into the gallery. Doing so is simply a case of clicking on the insert from other sources button, then selecting those images from your site’s media library. At any point you can switch to the “Config” tab to customize the appearance of the gallery, determining how it will look when it’s displayed on your website. These settings allow you to choose how many columns to use to display the images (up to six columns), which theme to use to style the gallery if you have installed this premium add-on, set the space between the columns, decide whether to crop the images in the gallery or not, as well as a few other options. The gallery settings are all configured at the individual gallery level. However, it would be nice if you could enter your preferred settings once in a central location, and then have them applied to all new galleries you create by default. When it comes to enabling crop for images in your gallery setting, you can set the crop dimensions to be applied to the thumbnails. While the images are cropped from the edges, there isn’t a way to change this through the settings. This isn’t ideal as it could result in your thumbnails showing a section of your image with no interesting or recognizable details from the full photo. However, if you don’t mind editing your theme’s functions.php file, you can change the image crop position that is used by all images. 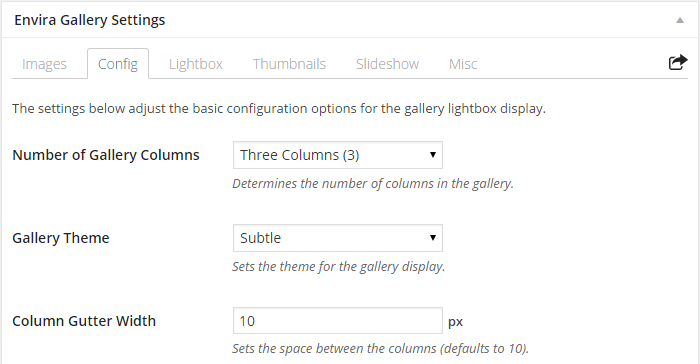 Premium users get access to a selection of settings to personalize the appearance of the lightbox display. This includes enabling or disabling the controls, including keyboard and mouse wheel navigation, maintain the aspect ratio of the images by resizing the lightbox window, and applying transition effects. Furthermore, if you are a bronze or greater license holder, you can enable the gallery slideshow for the lightbox window using the free slideshow add-on. The settings for the slideshow include enabling auto play and defining the slideshow transition speed. Finally, through the “Misc” tab on the individual gallery settings you can edit the gallery title, add custom gallery CSS classes, and a few other options. You can also export or import the individual galleries for use elsewhere on your site or another website with the plugin installed. Throughout the creation process you can preview your gallery as you would a regular WordPress post in order to see what results your chosen settings are producing. Once you are happy with the gallery it can be published, making it ready for use. 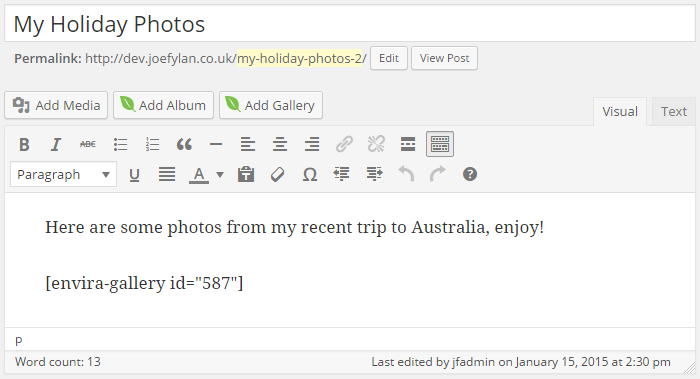 Adding the galleries to your posts, pages, and widgets is as easy as inserting the corresponding shortcode into place. The plugin also adds a button to the WordPress post editor to help you easily insert galleries and albums if enabled, into your content. The function code for inserting galleries in the theme files is also readily available. The above example uses the provided Base theme to style the gallery, and it’s the only theme included with the core version of the plugin. Other themes are available to silver and greater license holders as a basic add-on. As the galleries are all fully responsive by default, they will adjust to fill the full width of the area they’ve been inserted into. Using a one column layout will result in full width thumbnail being displayed automatically, while multi-column layouts will adjust the thumbnail size accordingly. As the galleries are fully responsive, they will be displayed just as well on smartphones as they are on the latest high definition large screen monitors. Clicking on any of the images opens them up in a lightbox window. This allows the viewer to scroll through the contents of the gallery, using either the onscreen controls or optionally, their keyboard and mouse. The lite version of the plugin gives you the ability to create a limited number of galleries and then insert them into your posts, pages, and elsewhere on your site. You can still choose the number of columns to use for organizing the image thumbnails, and the thumbnail images are still opened in a lightbox window, however that is about all you can do. Bronze license holders can create unlimited galleries, however they don’t get access to any of the basic or advanced add-ons which really make the Envira Gallery what it is. Bronze license holders can make use of the free add-ons. Upgrading to the silver license gives you access to the basic add-ons, while gold and platinum license holders get access to all add-ons, including the advanced options. The full list of add-ons can be viewed here and they are divided into free, basic, and advanced options. Some of the highlights of Envira that are delivered via the add-ons include the additional themes for styling the thumbnail gallery and lightbox window; the ability to create albums of galleries for better image organization, complete with cover images and much more; an add-on for displaying your images as large as possible in the lightbox window; and an add-on for allowing users to switch to full screen mode when viewing the lightbox gallery. There is also a free NextGEN importer add-on for making the transition from that plugin to Envira Gallery as painless as possible. It’s definitely worth taking a look at the add-ons to see which ones you are likely to want to use in your project. This allows you to workout which license you would need to purchase in order to gain access to those features. It’s worth pointing out that you can easily upgrade at any time by paying the difference in price in order to get access to those premium add-ons as your needs grow. Building an image gallery with the Envira plugin was straightforward. With just few simple steps the final result was a very attractive responsive thumbnail image gallery. When those thumbnails images were clicked, a larger version of the image was displayed in an equally attractive lightbox window. The user interface is very easy to get to grips with and thanks to the use of the native WordPress UI, it really did feel like a part of the core software as opposed to a third party plugin. Using the default gallery settings produces good results, making this a great choice for anyone who just wants to get the job done without sacrificing on presentation and basic functionality. For users with access to some of the add-ons and a willingness to explore the settings, you should be able to get the end results you need without any trouble. However, I did get the feeling that some power users might bemoan the lack of features compared to some of the other premium image gallery plugins out there. But for everyone else, the user experience of Envira and the end results more than deliver on its goals. This plugin feels like a part of WordPress and anyone familiar with the drag and drop interface and inserting elements into posts and pages using shortcodes or buttons on the editor won’t have any problems using Envira Gallery. If you need more advanced features, such as greater control over how your images are cropped, the ability to insert a slideshow into a post, paginate large galleries, individual image commenting, or add watermarks to your images, then you will need to go elsewhere. However, for most users this plugin should more than suffice. 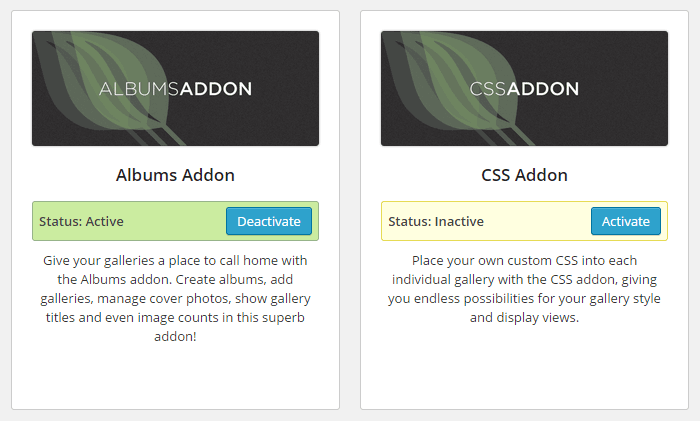 The free CSS add-on gives you the ability to customize the appearance of the galleries, helping to make this a very flexible plugin. It couldn’t be easier to get started with Envira and get your first gallery online. You won’t need to refer to the documentation, and a little bit of experimentation will reveal the differences between the selection of settings and options on offer. Choosing which add-ons you want or need to install may take some time. In some ways it would be preferable if the add-ons were automatically incorporated into the plugin in line with your license level. However, both approaches have their pros and cons. If you value ease of use and simplicity and don’t mind paying for it, then you are probably in the target market for this plugin and its pricing structure. However, if bang for your buck is your highest priority then you won’t consider Envira the best value for money premium plugin for adding advanced image galleries to your WordPress site. While the free version does let you add image galleries to your website, and the entry level premium bronze option gives you slightly more features for $19, to really get the most out of Envira you will need either the silver or gold licenses, costing $49 and $99 respectively. However, you can upgrade your license at any point and just pay the difference in order to get access to the more advanced features as you or your clients need them. If time is money then the ease and speed with which you can now create attractive image galleries helps to justify the cost of this plugin and its add-ons. 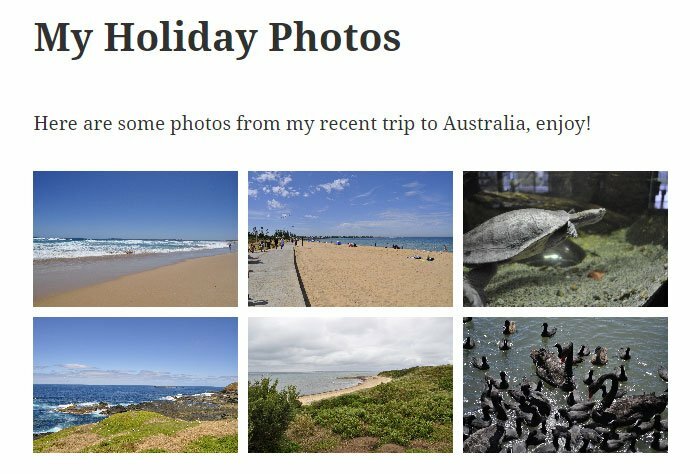 If you need a large number of features and functionality for managing your website’s images and displaying them in galleries on your WordPress website, then the pro version of the popular NextGEN Gallery plugin may well be a better option. However, if you have less demanding requirements and would prefer a more intuitive user interface and straightforward process for creating your galleries – not to mention more attractive galleries when using the default settings – then Envira is the better choice. The feature list of this WordPress image gallery plugin should be enough for most users, with the only sticking point being the relatively high price of $99 that is required to unlock the full power of this plugin. However, if you don’t need any of the advanced add-ons then the cost would obviously be lower. Pricing aside, this is a very easy to use plugin that contains a lot of great features that most importantly of all, outputs attractively presented image galleries in just a few simple steps. Have you used Envira Gallery? Let us know what you think about it in the comments below. I’ve used Envira for quite awhile (I was a big fan of Soliloquy as well). You’re definitely right, there aren’t quite as many features as NextGen. But in the time I’ve used it several more features have been added in. The recent version 1.3 update has added some stability and the ability to randomize images in a gallery. I think a very useful plugin for galleries best plugins I’ve seen lately thank you. Not WYSIWYG and you have to use functions.php, but it is possible.